I was in India this year for Diwali. It may sound rude but I was annoyed with the manner my mother was managing her home. I live a clutter-free life. I don’t buy things spontaneously. A lot of thought goes into buying even a set of wine glasses. I follow a simple policy - if I won’t use it frequently, I don’t buy it. This principle applies even to gold, which otherwise, is considered an investment. Things we buy and don’t use are a waste of money and space. The worst part is it creates a lot of negative effects that we fail to realize. Take this scenario - you like a sweater and it’s available at a throwaway price. Your instincts would force you to buy it. Great deal, new style, favorite color - you’d wear it repeatedly this winter. But you would not touch a couple of your old sweaters. They would pile-up at the back of your closet. 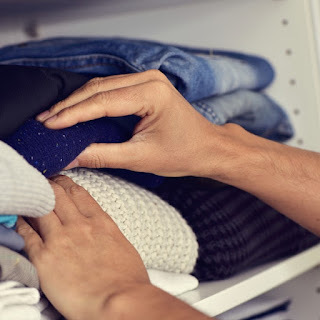 Your closet would be full and you will complain about lack of space in your home. We fail to acknowledge that it was our mistake from the very beginning. I’m not saying that we shouldn’t buy things we like. My point is to make sure that we have space to keep those things and lead a systematic life. I suggested my mother pick one corner of her room and take out things she rarely uses. By rarely I mean never or once a year. Then donate, throw, or sell those things. I told her to do this exercise for a month. She started this declutter game with her dressing table. Out of 10 nail paints, she admitted, she uses only 4 shades. Rest are accumulated and are never used. It was the similar situation with a box full of hair bands, pins, and a stack of bindi packets. A week later she was proud to announce that her room is clutter-free and it takes less time to dust and to find clothes in her closet. Start to declutter your home with minimalism game. Discard or donate 1 thing the first day, and increase the number of things as the number of days progress. 2 items on the 2nd day, 3 items on the 3rd day, and so on. You may find it difficult but it’s totally worth your time and effort. Please click and read the complete post on MoneyView blog. Very good tips.Sometimes I buy unnecessary things. I have been trying so hard to declutter but all in vain! Thanks for the tips!